Choosing the right eye shadow for your eye colour can have a big impact on your overall look. Choosing the right colour and style of cosmetics can enhance your eye colour and create bright eyes. Many women do not realise that your skin tone is equally important when choosing the right eye shadow. 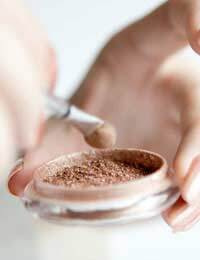 It is tempting to choose an eye shadow that is the same colour as your eyes, but this is usually a bad move. It tends to compete with your eye colour and ends up drawing more attention to the eye shadow, especially if it is a bright shade! This article offers advice on choosing the right eye shadow for your eyes. Your skin tone has a big effect on your ability to carry off certain shades of eye shadow. For example, if you have a delicate "English rose" complexion, dark colours can overpower your pale skin tone. For darker skin tones, avoid pale shades, as you can carry off much deeper and richer shades. To subtly emphasise brown eyes, you are far less restricted in terms of colour choices, as brown eyes suit almost any colour of eye shadow. This gives you the opportunity to experiment with a wide range of different shades, from soft neutrals to bright neons. Metallic shades are a particularly good look, as they are eye-catching without being too dramatic. Blue eyes suit warm shades of brown, taupe, gold, plum and peach. Wearing blue eye shadow usually has the effect of making your natural eye colour look nondescript. Metallics can work well, but stick to shimmery gold and bronze shades. Golden brown, taupe, rich purple, peach and violet shades will set off green eyes, and emphasise them as a striking feature. As a general rule of thumb, purple shades will work well on green eyes, so look for plum and violet shades. Be careful not to be too heavy-handed with these colours, as you can easily make your eyes look bloodshot. As with any colour, less is more! Grey eyes suit charcoal, brown and purple shades. Soft purple colours such as violet often work well with grey eyes. Don't be tempted to choose a certain eye shadow colour just because it is one of your favourite colours, or because it is currently fashionable. In a lot of cases, it will not suit your skin tone and eye colour, and can actually work against them. Choosing the right eye shadow can be the difference between a bright, healthy-looking skin tone, and a dull, lifeless complexion. Many people do not take their skin tone into consideration when choosing eye shadow, but it can be just as important as eye colour. You will generally find that colours that provide a subtle contrast to your eye colour will work well, as long as they are not too light or dark for your skin tone. If you want to play it safe, you can't go far wrong with soft neutrals, as they tend to suit almost any eye colour and skin tone. Isell makeup, what top brands do i sell for allergic eyes?